Home Gadgets Brand Strategy: Is a Controversial Name a Good Approach? Brand Strategy: Is a Controversial Name a Good Approach? Would you be Escobar’s customer? I’m not talking about Pablo Escobar, the drug lord who trafficked drugs within and outside of Colombia between the 80s and 90s and who murdered his fellow Colombians and others around the world. The one that was made even more popular thanks to the semi-accurate Netflix show “Narcos”. 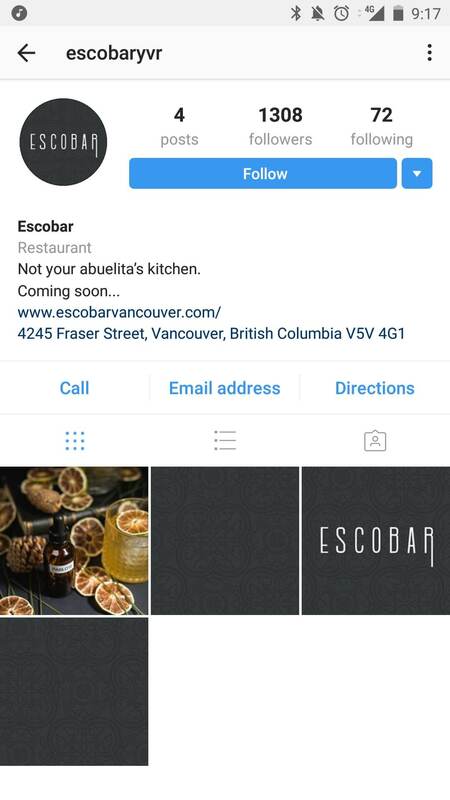 No, I’m talking about Escobar, the new restaurant opening in Vancouver in May, 2018, actually named after Pablo Escobar. I’m not kidding. This new business in Vancouver has been working hard on the design of their new high-end, fancy-looking Latin-based restaurant, and just made their name and opening date  public. I’m not entirely sure how they came up with the idea of naming their restaurant after Pablo Escobar, but it surely opens the opportunity to talk about their business and brand strategy. As a Colombian UX researcher and designer who grew up watching the constant news of Escobar’s activities, I can’t help but reflect on this restaurant’s business strategy and the potential issues here. Based on the photos released on the food blog, Dished, part of the news and advertising medium DailyHive, their interior designers have been busy coming up with an engaging concept that definitely looks sharp and high-end. The question is how effective and welcoming their restaurant’s name is for their target audience, since the name is one of the most important elements of a brand. Customer research can offer useful insights about the perception of a brand and its messaging ahead of a brand launch. If you don’t check with your target audience while you are designing your brand, you risk finding unpleasant surprises at launch, when essentially it’s too late. 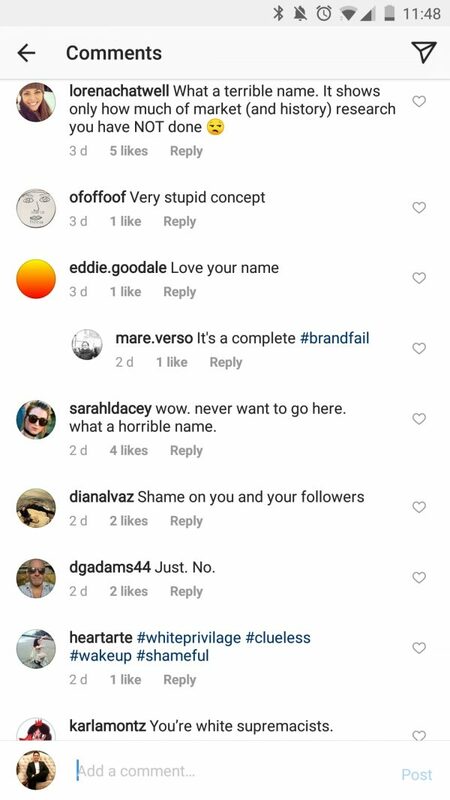 Looking at reactions to Escobar’s (the restaurant) opening posts on social media  (Image 1) and coverage by Dished [1,3] makes you wonder if the owners are experiencing an unpleasant surprise. 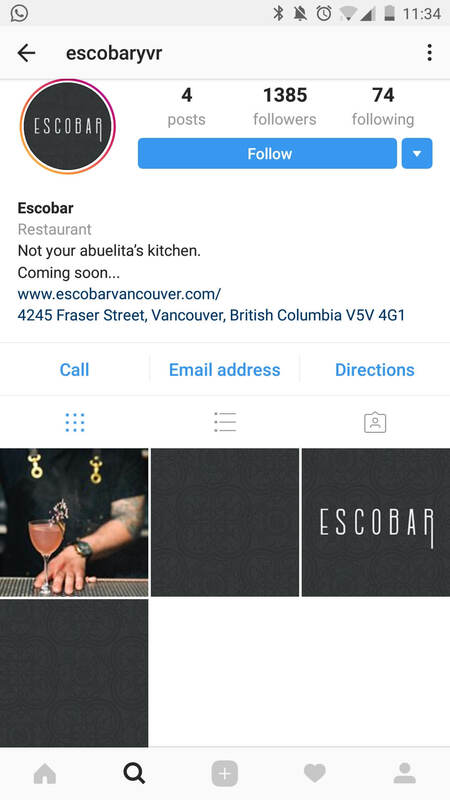 One of the first questions to answer when deciding to launch a business is: “Who is your target audience?” In Escobar’s case, their potential audience would be Vancouver locals (a bit over 600,000 in the immediate area, or 2.46 million in Great Vancouver  and visitors (10.3 million in 2017  who might want to experience Latin-inspired cuisine and beverages. Now, focusing on the business name, a good question would be: “How receptive would your audience be to the name?” It would be difficult to answer accurately without a combination of research methods. Conducting primary research with the target audience, such as interviews, focus groups and surveys, will uncover what the actual opinions are. However, a quick, no-cost review of existing statistics and some research on international history and culture, along with some basic common sense, could have brought to light the potential issues with choosing such a controversial name. Those neutral to the name could be unaware of the precedence or meaning of the name or could be those who actually know Pablo Escobar’s history to a certain degree and remain neutral about having a restaurant named after him. Initially, that could be a lot of people, but as awareness builds that number could diminish. In any case, neutrality to the name isn’t a solid indicator that the name is a good or bad idea. Now, who would be happy with the name of this restaurant? These could be people who know Pablo Escobar’s history (from Netflix or otherwise) or the history of similar drug lords and either would celebrate a tribute to such characters or would not think thoroughly about the severity of Pablo Escobar’s actions and the real impact on people’s lives. While there is a small community in Medellin, Colombia (Escobar’s hometown) who benefitted from his financial support and celebrated him at the time, they do not represent the restaurant’s target audience and are not worth considering as supporters when deciding the name. Perhaps Netflix watchers who enjoyed Netflix’s version of the story and either live in or would visit Vancouver would be part of the target audience. Unfortunately, there aren’t readily available reports providing numbers to how many people could fall into this group and getting access to this type of data would require further research. But articles about the show tend to strongly criticize the show or discourage people from watching it rather than inviting people to praise Pablo Escobar . One potential subgroup within the supporters could be people who celebrate such business (such as drug dealers) or maybe even belong to it (such as gangsters) . But who wants to attract this type of people to their business without being able to guarantee that nothing is going to get out of hand? So once again, there does not seem to be a solid indicator that naming the restaurant after Pablo Escobar is a good idea. But perhaps we can more readily count those who may not want to become customers of a business with this name. Those who would oppose this choice of a business name could be those who are aware of Pablo Escobar and his “business” or of similar drug lords and violent criminals. Not only Colombians, but also millions of Latin Americans still have vivid and sad memories of Escobar’s history and the history of other drug lords. Those who live outside of their home country still have to deal with stereotypes and discrimination for being nationals from countries with a history of drug trafficking problems. I have personally had to deal with the not necessarily bad-intentioned but ignorant comments such as “Oh, you are Colombian! So you do coke?” Trust me, it is no joke, and it’s never fun. This population is tired of fighting against stereotypes and the constant reminders of a tragic history. The Vancouver population matching this segment adds up to 11,000 Latin Americans. To this customer segment, we can add Vancouverites who are aware of the serious and long-lasting drug problem that is damaging to Vancouver’s safety and budget [8,9], and that has affected thousands of families who have lost relatives and friends to drugs and violence. The exact number is difficult to find, but reports show illegal drug use  and overdose deaths in the province of British Columbia was over 1,420 in 2017 . Just the number of Latin Americans in Vancouver potentially adverse to the name Pablo Escobar and the awareness of the serious drug problem in the province should be enough to make a conscious business owner aware of the potential issues of naming their business after the drug lord. Who wants to launch a new business leaving the door open to protests and disparaging comments on the news and social media? It seems like those who came up with the name didn’t conduct a serious and thoughtful naming process, which in turn, misinformed the brand design process. Or was it intentional? A logical marketing approach would be to buy ads with the restaurant’s name, which is becoming popular, in part thanks to the Netflix show. Once implemented, the restaurant name would likely appear when people are looking for the drug lord or the show, not just the restaurant. So, was this ignorance or a deliberate intention to benefit from morbid marketing? It wouldn’t be the first time a business decided to use controversy to get attention from the media [12,13,14]. But it will always be a dangerous strategy that could end up getting out of control and causing more trouble than benefit. 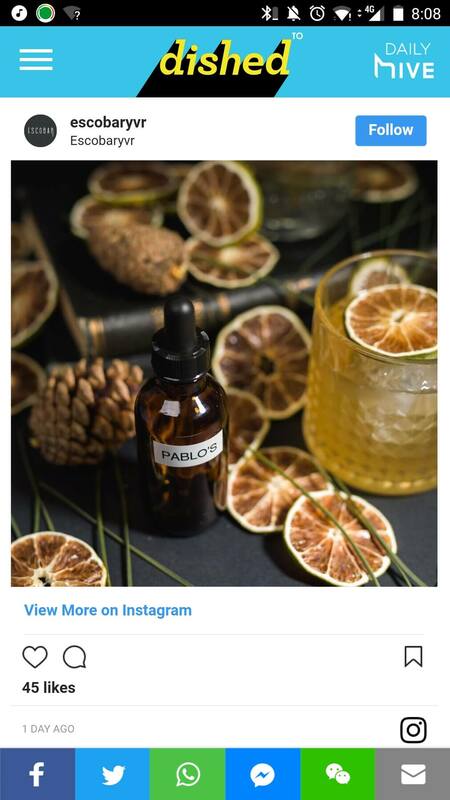 Just a couple of days after the restaurant started promoting the name online, Escobar’s social media admins removed the most controversial image from their Instagram account (Image 2 and 3), which at that point had received the highest number of comments against the name. This image depicted a dropper bottle with the label “Pablo”, confirming that their name was actually based on Pablo Escobar (not that they ever denied it). Based on Escobar’s reaction to the negative comments, it seems that this time they were not really looking for this type of controversy. Is Escobar’s kitchen on fire before their grand opening? Image 2: Escobar’s Instagram account before and after removing the most controversial image. Image 3: The image removed, depicted in Dished. Not available anymore. If you want to avoid a fiery situation like this, remember that brand design requires a well-researched, thoughtful and professional process that combined with an effective service and product design can deliver a positive and intended experience to your customers.